At last, The Magical World of the Anglo-Saxons is published! It’s been a lot of hard work and effort, but I hope you will agree that it’s been well worth it. This book invites the reader to enter the magical world of the early, heathen Anglo-Saxons. Often mistakenly regarded as the harbingers of the ‘Dark Ages,’ instead Tylluan shows their vivid world that refused to be suppressed by Christian missionaries. 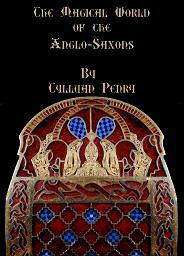 Tylluan is careful to separate the true Anglo-Saxon from the Norse and Germanic traditions wherever possible, so that this well referenced book offers a truly magical Anglo-Saxon experience. ‘The Magical World of the Anglo-Saxons’ is a great pleasure to read. Though a scientist by work, in my pagan walk I am very, very much interested in the historical side, but reading on the history of the craft is fraught with difficulties – between authors who view stuff too “coldly” and in a way that is, to me, too scholarly, and the ones who extrapolate any round with a mother goddess symbol. It’s hard to find a middle ground, but I think Tylluan’s reached it. When she describes fact, they’re facts, when they’re her hypothesis, she puts it clearly, and I really appreciate that ; and she really makes those old spells come to life and appreciate how they were done – and even more wonder at what we still have to discover that they did. She’s given me a good deal of pleasure in my daily work commute, in my Paris’s most busy subway line , so thank you a lot, Tylluan, and keep the good work!